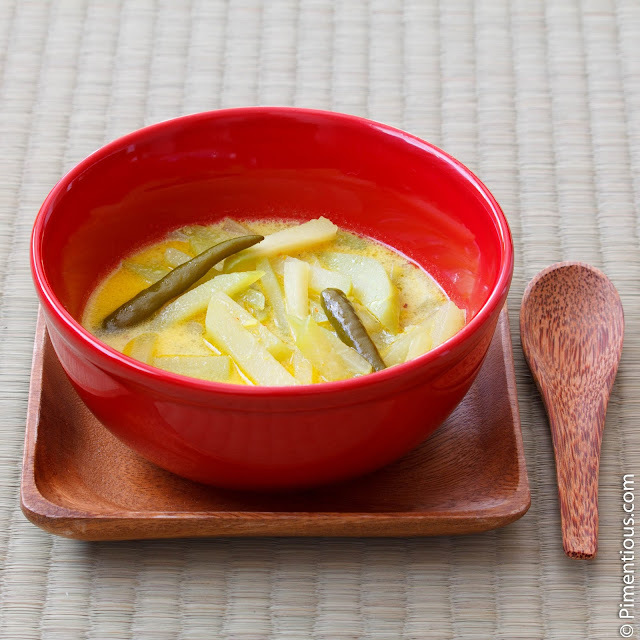 Sayur Lodeh is Indonesian version of vegetables curry. It has thin soup but very flavorful. Vegetables used in this dish usually are chayotte, eggplants, unripe jackfruit, and green bean. You can even add tofu and tempeh too. Back at my mom's place, she serves this dish with fried chicken, steamed rice, and shrimp chips (kerupuk udang), yummmm.. Et voila, serve with a bowl of steam rice. PS: after you cut the chayottes into sticks, sprinkle 2 tsp of salt and stir, make sure the salt coats it perfectly, then rinse it under a running water. This is to wash out the sticky sap out of it.